January, in between the two squirrel breeding seasons, is a quiet month. The over-wintering squirrels, autumn babies who were too young to release in 2016, are doing well. Two of them, the youngest, are inside, the rest are outside. They do not mind the cold, and played even on the coldest days, but they are not too fond of the rain – wet days are for sleeping in the nest boxes, as far as they are concerned. They all enjoy their diet of mixed nuts in shells, fruit and veg. My son Jonny, a young adult with autism, is responsible for feeding and watering all the squirrels, as well as the daily clean-out of the inside squirrels’ cage. I check on the squirrels daily to make sure they are thriving. On Saturday the 28th we attended the Vegan Festival in Dewsbury, where we ran a stall and I gave a talk dispelling the myths surrounding grey squirrels. The talk was very well attended and very well received. We had quite a few good conversations afterwards at the stall. It is interesting that, even at a vegan, i.e. a very animal-friendly, event, there are still quite a few people who need persuading that grey squirrels are not a conservation problem, but a fascinating part of British nature. The stall attracted a lot of interest. Squirrel-shaped tea strainers were a very popular item, as well as mounted prints and squirrel charm bracelets. The lucky dip brought it some money as well. Overall, however, the occasion was not a huge financial success, we ran at a £70 loss. But the message was spread, and that is always the main aim. Also, in return for the talk, the organisers are giving us a stall at the London event next month for free, so we should make up the loss there. Today I am going to pick up a new squirrel: he was hit by a car and nursed back to health about a year ago, by a lovely couple who can no longer keep him, because they are being threatened with eviction by their Housing Association. A very sad state of affairs, especially because the finders are vulnerable people who are very attached to the squirrel. I have tried to reason with their Housing Officer, but to no avail. We will just have to do our best for the squirrel. Paulie, the Housing Association squirrel I picked up last month, took a long time to settle, because she missed her humans so much. She is about 18 months old, certainly old enough to know what is happening to her and to dislike it. She spent several days sitting under the blankets on the floor of the cage. By now, I am happy to say, she has reconciled herself to her new situation, is eating well and has learned to sleep in the hanging bed – a vital habit, if she is ever going to be returned to the wild. We did another animal festival at the beginning of the month: the Greater London Vegan Festival in Camden. With sponsorship from the organizers of the event, as well as from AF Nuts (they sell nuts in shells on line), we did reasonably well financially, made around £100. As ever, it is more about advocacy than actual fund-raising. The talk was very well attended, though lack of PowerPoint made it a bit less effective, to my mind. Storm Doris did its bit against us. The cover blew off the big outside aviary, and we had to struggle to fix it back on like a couple of sailors in the middle of a, well, storm. The aviary itself is metal and mesh throughout, so the squirrels did not escape, just got a scare, because of all the noise, poor things. The supplies are in for the next baby season, expected to start in April. This year we are going to rear our babies on Fox Valley, which is 40% cheaper than our usual Esbilac, but has the same composition and was, in fact, developed by a guy who also worked on Esbilac. Importing the Fox Valley formula from America was a fiddly affair, but it makes financial sense. The last weekend of February was marked by a rather horrendous report in the Guardian concerning a volunteer drive by Wildlife Trusts. The volunteers, 5000 of them looked for, are expected to aid red squirrels by trapping and bludgeoning grey ones. I have written a letter for publication to the Guardian – not that it will be published, of course, since they get so many; and started a formal complaint process against the Wildlife Trusts. The campaign against the Wildlife Trusts drive to recruit volunteers whose duties would include bludgeoning to death grey squirrels gathered momentum in a way I had not foreseen. The extreme cruelty of their plans obviously touched a public nerve. A petition on Care2, started by a lovely young lady called Courtney Scattergood, gathered 80 000 signatures in less than 2 weeks. The star rating on the Wildlife Trusts Facebook page sank to 2.3, with plenty of polite, but very critical, comments. In fact, they removed the rating and comments feature altogether, because it made them look so bad! Many complaints were sent to the charity, both online and by letter. Before long, The Times newspaper described the reaction as a “public outcry”. Wildlife Trusts have not changed their mind about the ghoulish volunteer drive, but the complaints are now with the Charity Commission, and an anti-cull coalition is being formed, of which Urban Squirrels is going to be an active member. We managed to get two more festivals in (before the baby season starts), with the usual stall and talk routine: one in Bristol and one in Oxford. The Oxford festival was particularly useful, because we managed to have very productive discussions with Courtney Scattergood, the author of the anti-cull petition, and Isobel Hutchinson, CEO of Animal Aid, laying the foundations for a formal coalition to protect grey squirrels from unfair persecution. At the end of the month the first furry service user arrived, a 5-week-old baby called Sidney. He must have fallen out of a tree and had obvious and very uncomfortable (particularly for an obligate nose-breather) face trauma. His is doing well on medication and should make a complete recovery. The overwintering squirrels are all doing very well and should be released in mid-April. April is one of the busiest months in the baby seasons. Several new service users came in. Most of them were older babies, 5 or 6 weeks old, so not too many sleepless nights were required (the little ones are fed round the clock till their eyes open at about 4 weeks, but after that we all enjoy a good night’s sleep). Only one baby, Secundus, was a worry, and in some ways continues to be so. He and his siblings must have been on their own, without their mother, for a while, and by the time a kind member of the public found them, two had been killed by crows, and Secundus, the only survivor, was in a very bad way, though alive. The main problem was the multiple injuries and swelling around his face. 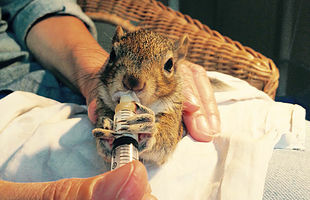 The treatment for it is conservative – anti-inflammatories and antibiotics (one cannot put a cast on a baby squirrel’s face), but it seems to have worked so far. Secundus, 8 weeks old now, seems to be able to bite and chew solid food. At his age he still needs a couple of full feeds of formula, so only time will tell whether he would completely get over his injuries and be able to eat completely on his own, and, hence, live an independent life in the wild. A smaller, but annoying issue with him is that the end of his tail was also badly injured – an amputation might be in order, because 2cm of the tail are now definitely dead. For all his problems, Secundus is a happy and active squirrel. His name means lucky, among other things, in Latin. So far his luck holds. Sidney, who came in at the end of last month, made a complete recovery and is now a very healthy and strong squirrel, waiting to be released, with his two cage mates, when they turn 16 weeks. On the advocacy front, the Stop the Grey Squirrel Cull Coalition (so far comprising Animal Aid, Farplace Animal Rescue, Humane Wildlife Solutions, Urban Squirrels and Saving Baby Squirrels) is writing letters and having meetings with Wildlife Trusts, as well as preparing for the official launch. As soon as the web designer catches up with his work and the Coalition website becomes live, we will be officially in operation. The Facebook page is already active. All the babies are no longer babies, but teenagers. During the month of May they all graduated to the big cages, where they will stay till June/July, when, at the age of 16 weeks, they will be soft-released into the wild where they belong. They are absolutely hilarious to watch, so the time it takes to look after them does not seem to decrease – only instead of feeding and cleaning, we are watching their antics. At this stage my son Jonny, a young adult with autism, takes over with the care. He cleans and disinfects the cages daily and gives the squirrels their nuts, fruit, veg, fresh water and twigs. Secundus, the squirrel who has given us quite a lot of worry because of his original injuries, has done very well: he is eating a variety of nuts and veg by himself and recovered after his tail-end amputation – lovely new hairs are covering the stump. He lost only a very small part of his tail, so he is not going to be either renamed Nutkin or kept as an unreleasable: when the time comes, he will go back into the wild with his two nest mates. No rescue work is, unfortunately, free from tragedy. A lovely baby whom we called after the month of May lived with us for only two days. After two more days in an oxygen tank at the vet’s she gave up the fight. Rest in peace, little one. On the advocacy front there has been quite a lot of correspondence. Urban Squirrels wrote to all the Wildlife Trusts, more than 40 of them, asking them to clarify their position on the subject of recruiting volunteers to kill grey squirrels. Only a few of the Wildlife Trusts actually participate in the culls, but nearly all of them replied to say that they support them in principle – as a last resort, etc. The commendable exception is Tees Valley Wildlife Trust, whose trustees discussed the issue and wrote back to Urban Squirrels to say that “the trustees agreed that many people in our area really value grey squirrels, particularly as a wild resident in parks and gardens”, and that their Wildlife Trust “has never had any involvement in a cull of grey squirrels and has no intention to do so”. So one down, about 40 to go! The month of June was a veritable festival marathon. On Saturday the 10th Urban Squirrels ran a stall at Birmingham Wildlife Festival; the three people manning/womanning it had a lot of very interesting and very useful conversations, as well as giving out numerous leaflets and raising some funds for the rescue work. On the 17th we were in Leeds for the Great Yorkshire Vegan Festival, with a stall and a talk. A couple of local supporters joined us, and, though financially we ran at a loss, awareness was raised, which is the main reason for being there in the first place. The media talk of the South and North divide in the attitude to grey squirrels, with people in the South liking them and protesting against the culls, and the people in the North supporting the culls in the belief that red squirrels can be helped by killing the greys (this is one of the myths that Urban Squirrels is working very hard to dispel). It is not clear whether this media image of public opinion is correct, but, just in case it is, we are trying to distribute our festival presentations more or less equally throughout the country, even though going a long way away from London, where we are based, is inevitably costly. On the 18th we were in Portsmouth, with a local rescuer, which whom we shared the (rather meagre, but still) profits. Nearly half of the money was raised by Magda from London by face-painting. As usual, Urban Squirrels gave a presentation dispelling the myths surrounding grey squirrels and shining a spotlight on the pernicious paradigm in conservation that allows for the killing of animals in the name of helping nature. The presentation will be put on the website soon. The bushy-tailed service users at home are all doing very well. Two groups, including the very personable Heathcliff and Magda’s rescue 4tune, are already at the release sites in the soft-release cages. The remaining youngsters are still with us, awaiting their turn and getting stronger and more agile by the day, a joy to watch. Festival season continued. We were in Penrith, Cumbria, for two days, running a stall and giving a presentation at a vegan festival in an area where red and grey squirrels share the habitat and where the greys are most vehemently accused of replacing “our native red”. In the presentation I did my best to bring to people’s attention the fact that the reds became very rare in this country, to the point of extinction, by the end of the 18th century. It happened before the greys were introduced and was caused by deforestation, by people depriving red squirrels of extensive pine forests that they absolutely need in order to survive – the reds are nowhere near as adaptable as their grey cousins. Red squirrels were then also introduced from Scandinavia, so the reds living in this country today are genetically mixed and native to Scandinavia, not Great Britain. At Urban Squirrels we love all squirrels, regardless of colour, and will continue to do our best to dispel the myths surrounding the greys. Another festival, again a 2-day one, took place at the end of the month in Cardiff, another area of grey and red interface. Interestingly, the people there were largely unaware that any culls were taking place on their own doorstep, and yet Wales is the scene of the most vicious culls in Great Britain. Financially, both festivals were quite demanding because of the travel, and especially because of the accommodation, and in the end we more or less broke even as far as the budget is concerned. It is felt, however, that it is very important to bring the message to the areas where it is needed the most, and not just stay in the South, or in London, where grey squirrels are generally liked anyway. Nearly all the spring babies are now wild and free. They have an abundant autumn to look forward to, and then a winter throughout which they will be helped with supplementary feeding. Roll on August, the month when it rains squirrel babies. We wish they would all stay with their mothers, but, if they do need help, it is heartening to know that the public are compassionate and ready to pick up babies in distress and take them to rescue. As anticipated, this has been a very busy month for baby squirrels. It is good to know that when people find a baby in trouble, they pick them up and make an effort to help, but it is proportionately heart-breaking when we have to say that, unfortunately, we are full. As a London rescue, we get full particularly quickly, and have to refer people to other licensed squirrel-friendly rescue places. But there are never enough placements to meet the need, and the licensing rules make it virtually impossible to use foster-carers and very difficult to train volunteers, which does not help matters either. Quite a few of our furry clients came in with fly strike this month: flies lay eggs on orphaned babies, the eggs hatch and the maggots feed on the babies, releasing toxins that are eventually fatal. In the previous three years we had two fly-strike babies, and lost both, unfortunately. So, when the first fly strike case of the season came in, I rushed to the vet in desperation. He suggested that, since the condition is usually fatal anyway, we might as well try a much harsher, but potentially more effective treatment regime. Scary as it was to pickle such little bodies in chemicals, we still tried, with brilliant results. All seven fly strike babies that were brought in to us have survived and are doing well. When the present clients are old enough to be released, it will be too late in the season to do so: they will not have time to build proper winter nests or store enough food for the winter. So all of them are going to be over-wintered here and released in May. This is where my son Jonny, a young adult with autism, comes into his own; the cleaning and feeding of the weaned juveniles is his job, and the one he is very good at. The cages are custom-built in such a way that he never actually has to open the door or handle the squirrels. The water is in a water bottle that attaches from the outside, the food in in swinging-out feeders, the floor of the cage pulls out for cleaning like a large shelf. The same cages are used for soft release later. Thinking ahead a bit: if anyone knows of suitable release places for squirrels, we would love to hear from them, we are always desperate for new locations. We provide the cage, which stays on site for about a months, so it is not a life-long commitment, but one that makes a lot of difference to grey squirrel rescue. The baby season has continued for quite a long time this year, with new little service users coming in even at the time of writing. At least the ones coming in now are older and do not require night-time feeding. We usually drop the night feed when the babies open their eyes (“they open their eyes, we close ours” is the rule of thumb), so from 4-5 weeks they are fed every 4 hours from 8 a.m. to midnight, leaving out the ever-popular 4 a.m. feed. While the youngest of the clients are still syringe-fed, the older ones are graduating to the outside aviary. This year we have replaced the tarpaulin cover with more aesthetically pleasing sheets of clear plastic screwed on top of the mesh to keep out the wind and the rain. The nest boxes have a starter kit of newspaper and Kapok, but the squirrels will continue to furnish them with dry leaves and straw as the weather becomes colder. Some squirrels, the ones that are a bit younger now, will be over-wintered inside. They will have a bit more warmth than the ones in the outside aviary, but a bit less space – swings and roundabouts. Stop the Grey Squirrel Cull coalition, of which Urban Squirrels is a founding member, is quietly, but efficiently working behind the scenes. Among other things, we aim to keep an eye on grey squirrel reports in the press and provide a prompt and well-referenced response to it. Keep an eye on the Stop the Grey Squirrel Cull Facebook page for details of that work, since the Urban Squirrels Facebook page is reserved mainly for rescue updates. And the festival season is nearly upon us! The baby season and the advocacy season overlapped this October. However, at the time of writing all the squirrels except one are settled in their over-wintering cages – some outside, some inside. The one exception is the latest arrival, a very sweet and very light in colour female called Helen, who is still on syringe feeds. A new initiative in the anti-cull work is the campaign, still in its infancy, to curb the culling of grey squirrels, and other wildlife, in London’s Royal Parks (Hyde Park, Green Park, Richmond Park, etc). These iconic open spaces, loved by locals and tourists, have become sites of extensive wildlife slaughter, as revealed by the Royal Parks in response to a Freedom of Information Request made by Animal Aid. The figures were published in a Mail Online exclusive on the 23d of October. The first step is to make the public aware of the extent of the problem. As its own tiny contribution to this task, Urban Squirrels has published a leaflet describing the issue (https://www.urbansquirrels.co.uk/royal-parks-cull-leaflet/) and, in the first instance, is going to join the anti-deer-cull campaign for some leafletting in London’s Richmond. The animals affected by the culls, apart from our own grey squirrels, are deer, foxes, rabbits, pigeons, corvids, Canada geese. There is therefore a lot of scope to join forces with other groups to protest against the culls and look for non-lethal solutions. This kind of cooperation is something that Urban Squirrels is going to actively explore in the next few weeks. In the meantime, the pre-Christmas festival marathon awaits, with 3 weekends in November (Sunderland, Oxford and Brighton) and, last but not least, the Animal Aid Christmas Fayre in London on the 3d of December. All with talks and stalls making sure our bushy-tailed friends are part of our festive season. The over-wintering squirrels are taking the cold weather in their stride, both the inside and the outside ones. The outside squirrels, only a few weeks older than the inside ones, are much fatter and furrier: their fur-coverage obviously responds to the temperature more than to their age. All the squirrels are now fed and cleaned by Jonny (the other founder of Urban Squirrels, my adult son with autism), while I concentrate on the advocacy side of the work. November was the month of back-to-back festivals. Sunderland was the first one. I aim to go to the North of England with the stall and the presentations whenever logistically possible; it is there, at the point of red and grey interface, that the advocacy is most needed. At this particular event, a few questions were asked from a clear “invasion biology” perspective. But no one argued, people just listened to my answers, so it was very civilized after all. Oxford and Brighton were less polarized. Once again, information was given out and money was raised – successful events overall. A terrible nerve-wrecking disaster befell me in the meantime. I had to give a series of school presentations to 6-7-year-olds. The children were lovely and it went very well in the end, but I was very nervous. My daughter, who is a behavioural therapist (working with autistic children, but regularly going into schools as well) coached me, thankfully. She told me not to put more than a handful of sentences together without asking the children questions or getting “volunteers” to come to the front to do things. Interestingly, she told me not to use PowerPoint, since the children receive too much information via the screen and it would not stand out to them. So I brought along my roller banner, knitted squirrels, blankets, syringes, etc, and it worked very well! But I was so nervous, I really hope I do not have to do it again in the immediate future. To move on to a slightly different subject, as those of you who follow the Stop the Grey Squirrel Cull page on Facebook would be aware, we have been able to keep close tabs on squirrel news reported in the media, and write quite a few letters to editors. The process by now is quite smooth: Animal Aid staff do a search (I think there is a special electronic facility for that – not just Google), send me a link and I put the item, usually with a comment, on the Facebook page, and write to the editor of the publication if necessary. As an early Christmas miracle, one letter, to the Sunday Herald, was published: http://www.heraldscotland.com/opinion/15693137.No_need_to_kill_grey_squirrels/ It was even accompanied by a cute picture of a grey squirrel (not one of ours though). Another article, in the Telegraph this time, stood out to us, because it did not actually contain any factual errors! Who knows, it may be the shape of things to come. Any optimism, however, is severely dampened by Welsh media, still very anti-grey, unfortunately. Work in progress. The over-wintering squirrels (the autumn babies who were too young to be released on the wrong side of winter) are doing very well. They do not know it, but there is a treat in store for them: Christmas trees discarded after the festive season. We pick up a couple of them from outside the neighbours’ houses and put them inside the squirrels’ aviaries, to be inspected, climbed all over, and stripped of all the buds. The festival season ended on a high note, with the stall and talk at Animal Aid Christmas Fayre in London. The stall was very popular and raised quite a bit of money for the rescue. The talk was also very well received – probably the best festival to date. A major development on the campaigning front is the petition on Care2 asking London’s Royal Parks to stop the culling of healthy wildlife. A freedom of information request made by Animal Aid resulted in the Royal Parks revealing the number of animals that they cull every year. The numbers are astonishingly high, and the species include deer, rabbits, squirrels, foxes, geese, pigeons, parakeets, crows, etc. You can read about it in detail here https://www.animalaid.org.uk/royal-slaughter-extent-royal-parks-wildlife-culling-revealed/ Our bushy-tailed clients are, unfortunately, the most numerous animal culled. The number of signatures at the time of writing is 92K. A healthy number, but much more is needed to make a proper impact. On advice from Care2 Urban Squirrels also wrote to the Royal Parks to inform them of the petition. The Royal Parks acknowledged the communication and said that they are preparing an official response. On a far more mundane note, Jonny (my son with autism) and I stocked up on nuts in shells in the Christmas sales. At £2 per kilogram, as opposed to the normal £6.40, it was well worth trawling the London supermarkets. We hauled in over 100 kilogrammes. The fact that I do not drive did not help, but Jonny’s ability to carry heavy bags on London transport certainly did.